Tourette syndrome (TS) is a frequent neuropsychiatric disorder of unknown etiology. A number of chromosomal regions have been nominated as TS loci in linkage studies, but confirmation has met with limited success and causative mutations have not yet been definitely identified. Furthermore, TS, chronic tics, and obsessive–compulsive disorder (OCD) occur at increased frequencies among TS relatives, supporting the view that these phenotypes represent parts of the same genetically determined spectrum. We ascertained a four-generation Italian kindred segregating TS, chronic multiple motor tics (CMT), and OCD, and we performed a ten-centimorgan (cM) genome-wide linkage scan in order to map the underlying genetic defect. Suggestive linkage to chromosome 14q31.1 (multipoint LOD = 2.4) was detected by affected-only analysis under an autosomal dominant model and a narrower phenotype definition (only the subjects with TS and CMT were considered as affected). The linkage peak increased and it approached genome-wide significance (LOD = 3.29) when a broader phenotype definition was adopted (subjects with TS, CMT, and OCD considered as affected). Haplotype analysis defined a ∼2.3 cM critical region, shared by all the relatives with TS, CMT, or OCD. In conclusion, we provide strong evidence for linkage of TS spectrum to chromosome 14q31.1. Suggestive linkage to an overlapping region of chromosome 14q was reported in a recent scan of TS sibling pairs. This region might therefore contain an important gene for TS, and it should be prioritized for further study. The online version of this article (doi: 10.1007/s10048-010-0244-7) contains supplementary material, which is available to authorized users. Tourette syndrome (TS) is a frequent childhood-onset neuropsychiatric disorder, characterized by multiple motor and vocal tics that wax and wane . Patients with TS frequently develop other psychiatric disorders, such as obsessive–compulsive disorder (OCD) and attention-deficit hyperactivity disorder. Furthermore, TS, chronic tics, and OCD occur at increased frequencies among relatives of TS patients, supporting the view that these phenotypes represent parts of the same disease spectrum [2, 3, 4]. The cause of TS is unknown, but segregation analyses in families and twin studies have consistently indicated a strong genetic basis (reviewed in ). Most segregation analyses in TS families found evidence for autosomal dominant transmission [6, 7, 8], but other studies concluded for a more complex inheritance [9, 10, 11, 12]. Studies of TS cases carrying rare chromosomal translocations led to the identification of candidate genes, most recently SLITRK1 [13, 14, 15, 16]. However, subsequent studies failed to convincingly replicate these findings; the involvement of the SLITRK1 gene also remains controversial (reviewed in ). In the past few years, a number of chromosomal regions have been nominated as TS loci in linkage studies [17, 18, 19, 20, 21, 22, 23], but confirmation has met with limited success and disease-causing mutations have not yet been identified, underscoring the complexity of TS genetics. Of note, linkage was detected in different chromosomal regions in most studies, suggesting the presence of substantial locus heterogeneity in this disorder. Here, we report linkage of TS spectrum to chromosome 14q31.1 in an Italian pedigree. Our data, together with results of a previous study , suggest that this region might contain an important gene for TS. Thirty subjects (23 family members and seven spouses) belonging to an Italian kindred (Fig. 1) participated in the study after written informed consent was given and approval was obtained from the relevant ethic authorities. Detailed clinical studies, diagnostic workup, and exclusion of involvement of the SLITRK1 gene in this family were described previously [24, 25]. A diagnosis of definite TS, definite chronic multiple motor tics (CMT), or definite non-specific tic disorder (NST) was established in several family members according to the criteria of the Tourette Syndrome Classification Study Group . The OCD diagnosis was made by two psychiatrists, using the Structured Clinical Interview for DSM and the Yale–Brown Obsessive Compulsive Scale (Y-BOCS) . An autosomal dominant mode of inheritance was supported by one instance of father-to-son transmission of the tics phenotype (subject III-10 to IV-14 in Fig. 1). A high prevalence of OCD in this family was also highlighted [24, 25]. Of note, since the publication of our previous reports [24, 25], the diagnosis was refined in two individuals during clinical follow-up: in the individual IV-14 a definite TS was diagnosed (he had previously NTS + OCD); in the individual IV-13 the previous diagnosis of CMT was removed due to insufficient evidence of tics at our personal examination and unreliable historical information. DNA was isolated from blood using standard methods. For the linkage study, 382 short tandem repeat (STR) markers, defining a ten-centimorgan (cM) resolution autosomal map, were tested from the ABI Prism Linkage Mapping Set Version 2 (Applied Biosystems, Foster City, CA, USA). Markers were amplified using standard polymerase chain reaction (PCR) methods and loaded on an ABI 3100 automated sequencer. Data were analyzed using Gene Mapper Version 2.1 software (Applied Biosystems). Additional markers for fine mapping were selected from the UCSC Human Genome Browser (http://genome.ucsc.edu/cgi-bin/hgGateway) or newly developed by us as described elsewhere . In order to optimally exploit the information content in the initial genome-wide linkage scan, all the markers with missing genotypes were re-typed until complete genotype data were available for all the individuals with TS or CMT. Multi-point linkage analysis was performed using Allegro v1.2c  and easyLINKAGE Plus v5.02  as graphical interface. Affected-only linkage analysis was carried out assuming equal recombination rates for males and females, equal allele frequencies (estimated from the observed genotypes), a disease allele frequency of 0.0004, and no phenocopies. One married-in subject (III-5 in Fig. 1) and her two children (IV-7 and IV-8) were also affected by CMT or TS, but they were set as “unknown phenotype” in all the linkage analyses. In the genome-wide scan, a conservative, narrower clinical model was adopted with only the individuals with TS or CMT considered as “affected”. Using this model, our linkage simulations using the program FastSLink V2.51 [30, 31] showed that the family had enough power to detect suggestive evidence of linkage (maximum possible two-point LOD score, 2.1; average LODs 1.4 and 1.1 at recombination fraction 0.0 and 0.1 cM). For locus-specific analysis of the identified region on chromosome 14q31.1, we also used a broader clinical model, in which the subjects with TS, CMT, and also those with OCD were considered as “affected”. Haplotype analyses were performed manually or using HaploPainter V.027beta . Primer sequences from the newly developed STR markers and their location on the human genome reference sequence (NCBI Build 37.1) are summarized in the Online Resource 1. For the mutation analysis of positional candidate genes, we sequenced all coding and non-coding exons and at least 50 bases of flanking intronic sequence. Primers sequences and PCR protocols are available from the authors. Direct sequencing of both strands was performed using Big Dye Terminator chemistry ver.3.1 (Applied Biosystems). Fragments were loaded on an ABI3130XL automated sequencer and analyzed with DNA Sequencing Analysis (ver.5.3) and SeqScape (ver.2.6) software (Applied Biosystems). In order to screen for gene copy number aberrations, two affected individuals (IV-14, V-3) were typed on Affymetrix GeneChip Human Mapping 250 K Nsp Arrays. Data were analyzed using Affymetrix Genotyping Console and Nexus Copy Number Professional V4.0 (BioDiscovery, El Segundo, CA, USA). The results of the genome-wide affected-only multi-point linkage analysis are presented in Fig. 2. This analysis was performed under a conservative, narrower clinical model (only subjects with TS or CMT considered as “affected”). Interesting LOD scores (>1) were observed in three regions, on chromosome 4 (markers D4S424–D4S415), on chromosome 14 (markers D14S276–D14S280), and on chromosome 21 (pter-D21S1914). Increasing the phenocopy rate up to 0.05 did not change these results significantly (data not shown). These three regions were fine mapped by typing additional known and newly developed STR markers, and haplotype analysis was performed. The region on chromosome 4 was shared by all but one of the subjects (III-6, a CMT case) considered as affected in the linkage analysis (Online Resource 2). Thus, unless this person is a phenocopy, this region does not contain the genetic defect underlying the TS spectrum in this family. Also, we cannot exclude that this region contains a modifier of the phenotype severity. The region on chromosome 21 was not shared by one TS and two of the CMT subjects, considered as affected (Online Resource 3), and was therefore also excluded from further study. On the contrary, the analysis of the chromosome 14 region revealed a haplotype of ∼2.3 cM shared by all the relatives with TS or CMT, considered as affected in the linkage analysis (Fig. 1). Only the married-in subject with CMT (III-5) and her two children with TS (IV-7, IV-8) did not share the haplotype (these subjects are boxed in Fig. 1). Recombination events occurring in the individual III-10 proximally and in the individuals IV-14, IV-3, and V-3 distally define the borders of the region, flanked by the markers CGR435 and D14S1035. When the STR markers typed for fine mapping of the chromosome 14 region were included in the linkage analysis, a maximum multipoint LOD score of 2.4 was obtained under the narrower clinical model (TS and CMT as affected) (Fig. 3a), while under a broader clinical model (TS, CMT, and also OCD as affected) the maximum LOD score increased to 3.29 (Fig. 3b). Of note, all the subjects with only OCD also shared the linked haplotype (Fig. 1). The chromosome 14q critical region corresponds to ∼2.9 Mb on the physical map (NCBI human genome build 37.1) and harbors six protein-coding genes: DIO2, C14ORF145, TSHR, GTF2A1, STON2, and SEL1L, and one gene for a small nucleolar RNA, SNORA79. For all these genes, we sequenced all the exons and exon–intron boundaries, but novel variants that segregated with the disease status were not detected (Online Resource 4). Lastly, the analysis of the Affymetrix GeneChip Human Mapping 250 K Nsp Arrays did not detect gene copy number aberrations on chromosome 14q31.1 in the two tested subjects (V-3, IV-14). We describe linkage to chromosome 14q31.1 in an Italian family segregating a broad phenotypic spectrum ranging from typical TS to CMT and OCD. Linkage studies of TS might be complicated by a number of factors. The current uncertainties about the exact inheritance model, the definition of phenotype, and its relationships to other tics and psychiatric disorders (OCD and attention deficit hyperactivity disorders) might led to wrong clinical and genetic model specification in linkage analyses. Due to the high population frequency of TS and assortative mating, phenocopies might be an important issue, especially in very large families with multiple affected members. Furthermore, incomplete penetrance is likely present on the basis of segregation analyses, and locus heterogeneity has been suggested by previous linkage studies. In order to avoid the effect of possible incomplete penetrance, we performed an affected-only analysis including only the subjects with TS or CMT as affected. This conservative model yielded suggestive linkage only to chromosome 14q31.1, with LOD scores very close to the maximum predicted by simulations, for a family of this size. Of note, interesting linkage peaks in other genomic regions were not detected. However, linkage to another region could have escaped detection because of reduced informativity of one or more microsatellite markers. Since there is compelling evidence from previous genetic epidemiological and linkage studies that TS, CMT, and also OCD might represent different clinical expressions of the same disorder, we explored the effect of adopting a broader phenotype definition that includes also OCD. The linkage peak on chromosome 14 increased and now was very close to the threshold for significant linkage in primary genome-wide scans according to standard criteria . Furthermore, the disease-linked haplotype was shared not only by all subjects with TS and CMT but also by all those with OCD (Fig. 1). In keeping with reduced penetrance of the underlying mutation, individuals III-1 and IV-3 (Fig. 1) are non-manifesting obligate carriers of the disease-linked haplotype. Seven unaffected offsprings are still at risk of developing the disorder (IV-9, IV-10, IV-11, IV-12, IV-13, V-4, and V-5), and four of these carry the disease-linked haplotype (IV-10, IV-11, IV-13, and V-5). Of note, all of these four were described by their relatives with a “very nervous personality”, as opposed to none of the three non-carrier offsprings. Follow-up might tell whether these observations are coincidental or they point to mild, earlier features of the TS spectrum disorder. The largest genetic study of TS reported so far analyzed 238 nuclear families containing 304 affected sibling pairs (ASP) and 18 multigenerational families . Considering only the subjects with TS as affected, the strongest evidence for linkage was found in a region on chromosome 2p. However, the linkage signal to the same region increased when the subjects with CMT were also included as affected . The same study detected suggestive linkage to a few additional loci, in keeping with different genes being involved in different groups of families. Interestingly, out of the only three peaks with NPLpairs score >2.5 detected in the ASP genome-wide analysis, the highest was on chromosome 14q, and again this result was obtained either when TS subjects only or when TS and CMT were considered as affected . Linkage peaks detected in ASP studies usually spread over large chromosomal segments and they lack exact borders. However, the marker yielding the maximum LOD score in our study (D14S1000) is only ∼10 Mb and ∼13 cM from the marker yielding the maximum LOD score in the ASP study (D14S280). Our region lies therefore under the linkage peak of the ASP study, and the two studies might indeed have identified the same genetic locus. The ∼2.3-cM interval detected in our study corresponds to a ∼2.9-Mb region on the 14q31.1 physical map (NCBI genome build 37.1). This region contains, besides seven pseudogenes, six protein-coding genes and one gene for a small nucleolar RNA. STON2 encodes an AP-2-dependent endocytic sorting adaptor for synaptotagmin internalization and recycling, suggesting involvement in neurotransmitter release at the synapse ; C14ORF145 is a gene of unknown function, that is, mainly expressed in thymus but also in brain, spinal cortex, cerebellum, and retina; GTFII2A1 encodes the general transcription factor IIA, a component of the transcription machinery of RNA polymerase II, and plays an important role in transcriptional activation ; DIO2 encodes the protein responsible for the deiodination of T4 (thyroxine) into T3 (triiodothyronine), essential for providing the brain with appropriate levels of T3 during the critical period of development ; TSHR encodes the receptor of the thyroid-stimulating hormone ; SEL1L encodes a protein involved in ubiquitin-dependent endoplasmic reticulum-associated protein degradation; SNORA79 (RNA, H/ACA box79) encodes for a small RNA molecule involved in a variety of processes such as gene transcription and RNA splicing. Among these, STON2 appears to be the strongest candidate for TS based on function and expression pattern. Mutations in DIO2 and TSHR are associated with Graves’ disease of the thyroid [38, 39], and therefore these two genes seem less likely candidates for TS. We sequenced the coding regions of all these genes, but mutations were not identified. Also, evidence of copy number aberrations was not found by the analysis of the SNP arrays. One possible explanation is that a more complex and unusual type of genetic defect underlies TS in this family. A large insertion, inversion, or another complex chromosomal rearrangement might be present that is not detectable by the sequencing and copy number assays performed. It is also possible that the mutation-causing TS is present in a non-coding region (such as promoters and other regulatory intronic elements), which were not sequenced in this study. Furthermore, regulatory DNA elements might be located far away from the target gene(s) . Mutations within linkage regions might therefore affect the regulation of genes located outside the borders of the critical region. In this perspective, it is worth mentioning that a very interesting candidate gene, NRXN3, maps just outside our linkage region. This gene helps to specify and stabilize synapses and provides receptors for neuroligins, neurexophilins, dystroglycans, and alpha-latrotoxins and is also associated with addiction . One possibility is that a regulatory element for NRXN3 resides in the 2.9-Mb linkage region, and it might be affected by a disease-causing mutation in this family. We acknowledge that the family size is the main limitation of our study. Our linkage analysis under a more conservative clinical model (TS + CMT) had enough power for detection of linkage at only a suggestive level. 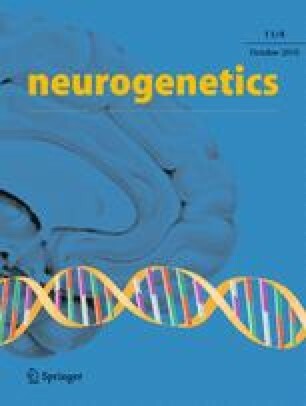 However, our results might represent genuine linkage, because linkage signals in other genomic regions were not detected; LOD scores close to genome-wide significance (3.29) were achieved using the broader clinical model (TS + CMT + OCD), and a disease-linked haplotype was shared by all subjects with TS, CMT, and OCD. Importantly, our results also represent independent confirmation of the suggestive linkage to chromosome 14q reported in the recent ASP study . Our mutation analysis performed so far should be considered as a first step, and further screening is warranted. The implementation of the new DNA sequencing technologies of massively parallel sequencing  will be crucial for a complete scanning of this chromosomal region and might facilitate the detection of the genetic defect underlying TS in this locus. This study was supported by the Erasmus MC, Rotterdam, The Netherlands. We thank all the family members for their participation, Dr. David Pauls of Massachusetts General Hospital, Boston, MA, USA and corresponding author of the Tourette Syndrome Association International Consortium for Genetics, for sharing unpublished data concerning the reported chromosome 14q linkage peak, Bert Eussen (Department of Clinical Genetics, Erasmus MC) for advice concerning the copy number analysis, and Tom de Vries-Lentsch (Department of Clinical Genetics, Erasmus MC) for artwork. All experiments comply with the current laws of the country in which they were performed. The authors declare that they have no conflict of interest.